Crunchy, slightly chewy in the middle, very chocolately but not overly sweet: these gluten free and vegan cookies might possibly be my favourite treat at the moment. You can make them nut-free by simply omitting the chopped almonds, and maybe substituting some chopped coffee beans in their place? Or more chocolate chips - you could definitely do that. It always delights me when I bake something gluten free that has my husband devouring batches. While I think it's lovely to treat the ones you love, my motivation is a bit more selfish than that: he has this idea that gluten free items aren't as good as the traditional variety of baked goods and I love to make things that challenge that assumption. I was telling a friend over the weekend about his ideas about gluten free tastes and textures, and laughing because I think it's actually got more to do with whole grains than the absence of gluten (since he has a similar reaction to whole wheat, spelt, and kamut items...). Of course, I totally get it that gluten free tastes different and that there are some bad-tasting gluten free baked things out there, but I'm more the type to embrace things for what they are and have grown to love the variety and tastes of gluten free flours. 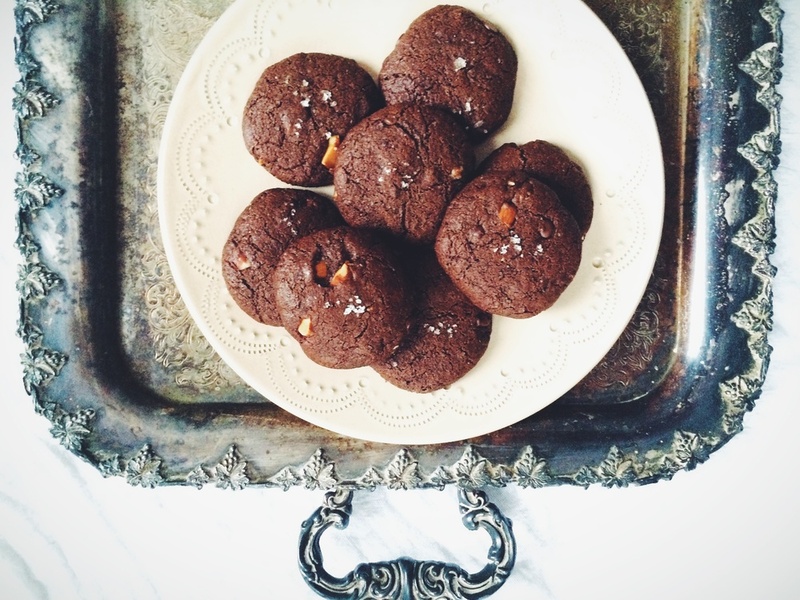 These cookies are a good example of how gluten free ingredients can really shine. They're really, really good. Tahini is the secret star here. I mixed these up on a whim last week, and have been baking batches that are almost identical to the first since. The only differences were a teaspoon of oil here, and a tablespoon of starch added in another batch. My final, favourite version is not-too-oily, spreads just a little bit while baking (but there is no risk here of the cookies spreading into a tray-sized mass here), and totally satisfy sweet tooth cravings without sending your blood sugar into shock. I have a few ideas for how these can be adapted too, because they serve as a wonderful cookie base. You could add a drop or two of peppermint essential oil for a Christmas version (omit the almonds and the flaked salt topping, and use half the amount of vanilla if you're going that route). Instead of almonds, you could use roughly chopped coffee beans and call them mocha cookies. Alternatively, you could add some dates chopped into small pieces for a caramel-like chew. Preheat the oven to 350 degrees Fahrenheit, and line a baking sheet with parchment paper. Combine all the dry ingredients in a medium-sized bowl, whisking to integrate and ensuring that no lumps of coconut sugar remain. Add the tahini, olive oil, maple syrup, water and vanilla extract, and use a spatula to mix thoroughly. No dry bits of flour should remain - this takes a minute or two. Stir in the chocolate chips and almonds. Roll dough into small, tablespoon-sized balls, then press gently to flatten. Sprinkle a small amount of flaked salt onto each cookie. Bake for 10 minutes in the preheated oven. Allow cookies to rest for a few minutes before transferring to a serving plate, they firm up as they cool. Keep in an airtight container for a couple days, or freeze for 1 month.